HomeIndustry NewsIs the tradition of Christmas tipping still going strong? Modern manners specialists Debrett’s suggest giving a £5 tip to those delivering goods to your door, along with those taking rubbish away. But in the days where people rarely see their refuse collector, don’t know their postie and carry less cash, is the tradition dying out? Jason King and his dad Neil have worked as postal workers for more than 14 years. Last year Jason says he made £350 from tips, which he puts down to knowing his customers, and never leaving a package undelivered. But more experienced dad Neil brought home a haul of £600, plus around 50 bottles of wine and a huge stash of chocolates. Neil has a special technique to help his customers embrace the season of goodwill: he delivers post dressed up as Santa. In the run up to Christmas, he and his colleague, who dresses as an elf, embark on festive deliveries around their patch in a Cambridgeshire village. “The kids love it, the mums and dads spend a bit of a time saying hello,” Jason says. Jason said he’s only gone as far as sporting a Christmas jumper, but is tempted to follow his father’s footsteps. Throughout December, their sorting office is awash with gossip of colleagues’ Christmas tips totals. But he says “it’s not a competition” and that those who deliver to villages tend to do better than those in towns, since they know their customers better. “I would never tip my postman!” he laughs. He isn’t the only one who doesn’t think about festive tipping nowadays. A recent survey of 2,000 people by British Corner Shop found only 8% of 25-34 year olds said they’d tip their postal worker and refuse collector at Christmas, versus 20% of over 55 year olds. Rachel Waterman, 44, from Northwich, Cheshire, hasn’t carried on her parents’ tradition of Christmas tipping. But she says times have changed, and services have become far less personal: “Now the postman doesn’t come until halfway through the day – I’m at work. “Mum talked about tipping the hairdresser – I’ve never tipped my hairdresser,” she said. Rachel says like others, she doesn’t carry cash as often, making it harder to quickly pass on a few pounds or tell people to “keep the change”. 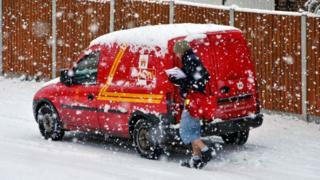 Royal Mail previously warned postal workers against accepting festive tips of more than £30 for fear of bribery charges. William Harvey, a 24-year-old postal worker from North Lanarkshire, said he didn’t know Christmas tipping existed until a woman came up to him and tried to give him £20. In his first winter as a postal worker, he’s received £90 in tips so far. “Even if I’ve not got mail for them, they just run after me and say ‘here, that’s for Christmas’,” he says. One of his colleagues, who has been working the same affluent area for 30 years, said he’s been given a £1,000 so far this season. “He says he’s got a grand, he’s just paid for his holidays next year,” William laughs. But it’s still only a minority of people who tip, he says. Neil Fay, 45, from Liverpool, says he gives a tenner to the postie and the person delivering his milk – but the refuse collectors won’t be getting a look-in this year. “My parents did tip the binmen in the days when they would take anything from you. “A milkman costs me more than supermarket but I like the idea of a community based service and he’s a lovely fella. Neil says he’s picked up the tradition from his parents generation but he doesn’t think it’s so common now. Lying in bed I’ll looking at the terrible weather outside and thinking don’t forget to tip your postman at Christmas- they go out in terrible weather every day of the year for not great pay and December is the worst month because of all the additional parcels and freezing cold. “But even just a small token of appreciation to somebody might just put a smile on their face for a bit and that can’t be a bad thing,” he says.